According to Jürgen Tautz in his book The Buzz about Bees, so-called orientation flights generally occur only when a queen is present. So I’ll take this activity as a good sign. While it hasn’t been very cold yet, we had warm weather last year at this time and it turned bitterly cold after the new year and stayed cold well into March. So I’ve been contemplating what to do with the hives to give them the best chance of surviving until Spring. Most local beekeepers say that insulation is not needed in our region, though a number of local keepers have said their hives died in those final weeks of extreme cold. Of course, by “bitterly” and “extreme” I mean below freezing. This is still Virginia, so its all relative. So I’ve been thinking of just insulating the top of my hives. Bees form a cluster, or sphere, of bees during the winter, so basic science supports insulating the top. Since heat rises, the most heat loss is likely to occur through the cover. Insulating the top of a hive helps maintain the warm air above the cluster, allowing the bees to work less than they would otherwise. This in turn conserves their food supply, as the bees consume honey when they need energy to warm the hive. In addition, those warm little insect bodies generate moisture, just like you and I when we exercise our muscles. This creates humidity in the hive which condenses as water on the inside surfaces. If this water drips onto the bees, they can freeze, which reduces the cluster size until the colony can no longer stay warm. The good news is that water tends to condense on the coldest surface. So insulating the top causes condensation to more likely form on the walls of the hive, away from the bees. Our local Lowe’s carries a foam insulation with an R-value of 5 per inch. The 3/4 inch pine board used in most hives has an R-value around 1, so this is quite an improvement. I didn’t want go too crazy with insulation, but insulating the top of the hives seemed reasonable in case we get some extended cold this winter. According the manufacture’s web site, the product qualifies as a green building material. If its on the Internet, it must be true, so I figured this was a good choice for hive insulation. Actually buying some of this product turned into a bit of a challenge. I have a Toyota Prius, which serves me well in my daily commute. Perhaps not so well as a construction vehicle. The foam comes in 4 feet by 8 feet sheets, which is a bit bigger than the back of my Prius. My solution was to cut the sheet in half. Surely I could stuff a 4 by 4 sheet into the back. I knew Lowe’s cuts wood to size, but it turns out the foam tends to “gum up” a saw blade and they don’t cut it. The Internet (remember everything is true!) taught me that the best way to cut these sheets is to score it with a utility knife and break it against a hard edge. So I borrowed a knife from the staff, used a 4 foot sheet of plywood as my ruler and straight edge, and ended up with two nearly identical squares of form. It worked extremely well. My work space in the middle of the parking lot. Mission accomplished, I purchased the plywood, the foam, and my own utility knife and was on my way. As you might expect, it turns out a 4 by 4 sheet of foam insulation is still too big for my Prius. My first thought was my neighbor, whom I had just seen in the store, so I went back in to look for them but to no avail. I was on my own. 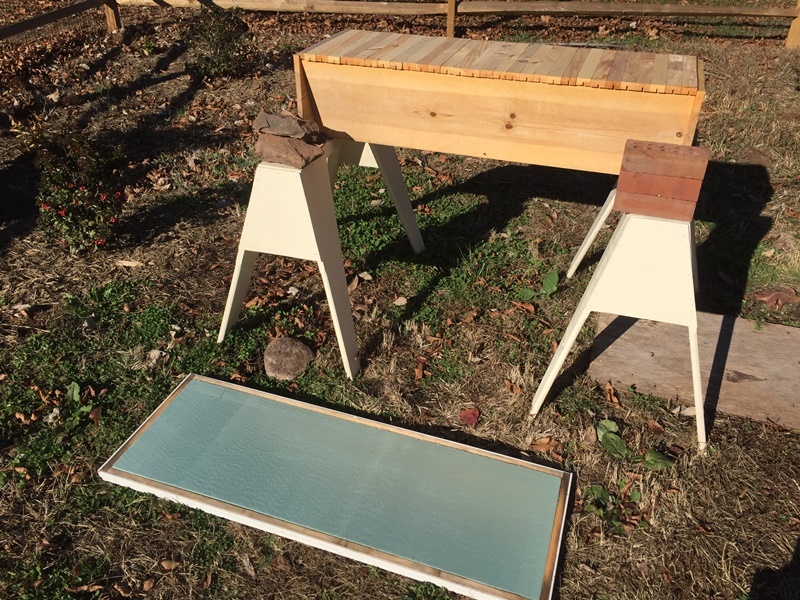 Fortunately, I am a clever man, and had already measured my hives: the top bar hive needed a 4 ft by 15 7/8 inch piece of foam, while my 8-Frame Langstroth boxes needed 19 7/8 by 13 3/4 inches. I also had a small tape measure with me, so I was in business. There was just enough space between the cars to cut the sizes I needed from each 4 by 4 piece. I got a couple strange looks, but the end result fit in the Prius. After multiple cuts, the foam board finally fit in the back of my car. At home, slicing and breaking the board into the proper rectangles went rather quickly. I am sure if the bees should be exposed to the form directly, or if they might chew out little pieces of foam over time, so I used the quarter-inch plywood to create a base. Some people worry about the glue used in plywood, but a number of beekeepers appear to use plywood for hive bodies so I figured it would certainly be okay over the inner cover for a few months. For Venus, the top bars are flush against each other and form the roof of the hive. 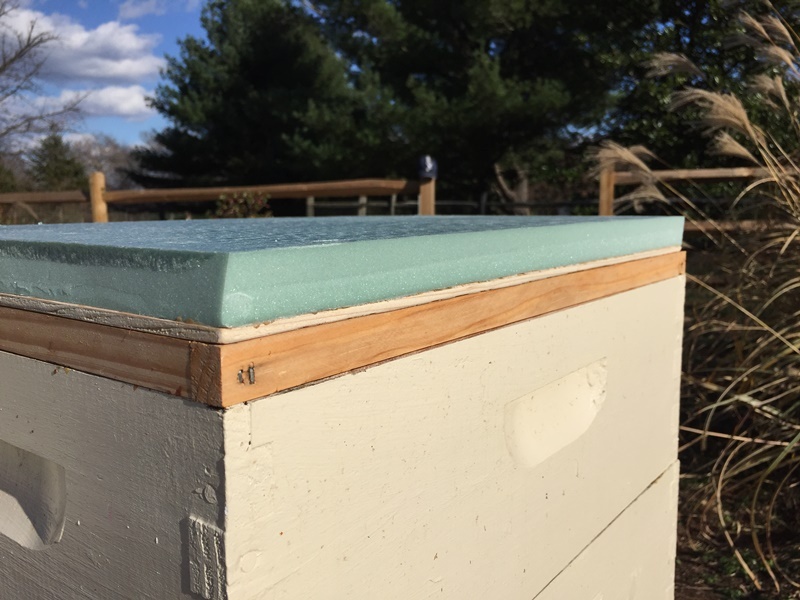 The foam board sits inside the cover as shown in the picture, and then on top of the hive. At this point I realized a potential problem to my plan. With the foam in place, the lip of the cover does not fit over the top bars. So a freak wind or snowstorm could slide or otherwise blow off the cover. I used a few bungee cords to secure the cover to the top of the hive. My insulation board on top of Jupiter. For Mars and Jupiter, the Langstroth boxes, I glued the foam onto a piece of plywood and weighted it down for a couple days (no nails!). Tuesday I placed these on the hives and used ratchet straps to secure the cover. There is also a concrete block on top, which is probably not needed. It makes me feel better, though, so it serves a useful purpose. A final consideration was the so-called fish pond. It’s rather small, and the bees never took to it. I was informed by my lovely wife and daughter that letting the fish die in the cold was not very nice. So even though keeping it warm is more expensive than what I actually paid for the fish, I went out and bought a heater. Call it the price of love, or something. The water lily I removed and brought inside for the winter. With the heater I may have been able to leave it in the pond. Instead it is stored in a bucket of water in my basement as per some directions I found online (which, of course, I assume to be true). We’ll see if it survives into spring. The heater I purchased clearly states not to use an extension cord, but given the distance from the house I really didn’t have a choice. I used a heavier-duty cord and checked the electrical rating to make sure it supported the voltage and wattage requirements. The heater is simply a trough deicer from a local horse supply store, which I hope will keep the water enough above freezing for the fish to last the winter. I still need to exchange the water occasionally to make sure they have fresh oxygen. We’ll see how it works. Yesterday (Wednesday) we drove through a rather warm day to visit our friends (to the north!) for American Thanksgiving. We actually turned the air conditioning on for a bit, it was 60+ degrees (15+ C) outside. We usually have Thanksgiving with family; this year we are joining friends for a large dinner with 25+ people and a fun-packed weekend. Before we left I peeked on the bees and pulled the bottom boards from the Mars and Jupiter, our two Russian hives. I was a bit dismayed to see a large number of mites (more than 20 on each board!). I had looked over the summer at these boards, and never saw more than a few mites. Now I wonder if I missed the mites because I didn’t really know how to spot them. Now that I’ve done a sugar shake on Venus I know exactly what a mite looks like, and I spotted the multitudes right away. These hives had very little brood a few weeks ago so perhaps the remaining mites are simply dying off (hopeful thinking, I know, but hey!). These boards have been in for more than a week so this was not any sort of accurate measure. I cleaned them off and will have to check them again more carefully when we return home. I have really enjoyed the Russian bees, so I hope they pull through. Stay tuned. One source for the history of this proverb is the book The Facts on File Dictionary of Proverbs by Martin H. Manser. I discovered this on google books (not sure if this link will consistently work or not), and then found it on Amazon as well. The book looks rather interesting for someone constantly looking for apropos phrases to use in random blog posts about bees…. I added it to my Christmas list. As for our blog title, I didn’t have much luck finding winter-appropriate bee quotes or phrases about insulation or warmth. We’ve had a number of relatively warm sunny days, and I suspect the bees are somewhat happier on sunny days, if bees can said to be happy. Hence, our title. Nice post! 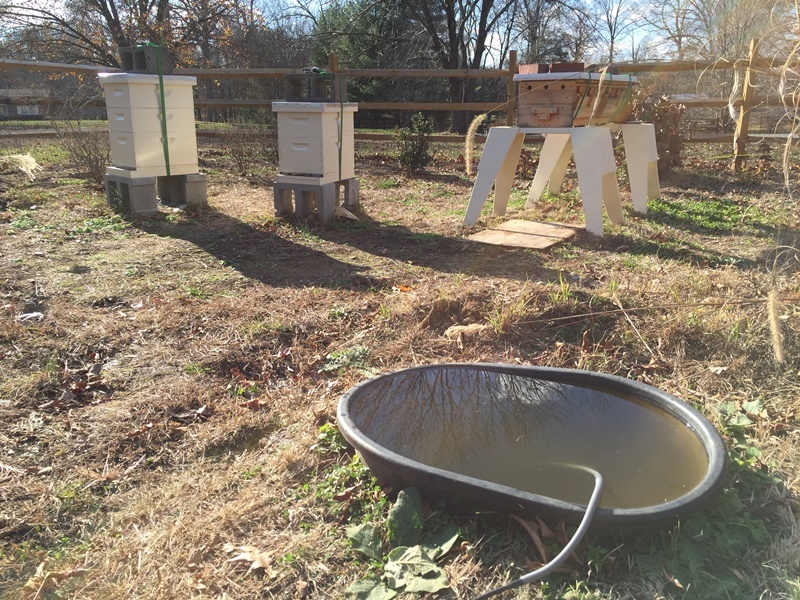 Your bees (and fish) look cozy and ready for winter! Fingers crossed for your Russian bees. Hopefully, they’ll pull through. I’m glad you mentioned the book by Jurgen Tautz since that’s on my wish list for Christmas. How did you like it? Thanks! 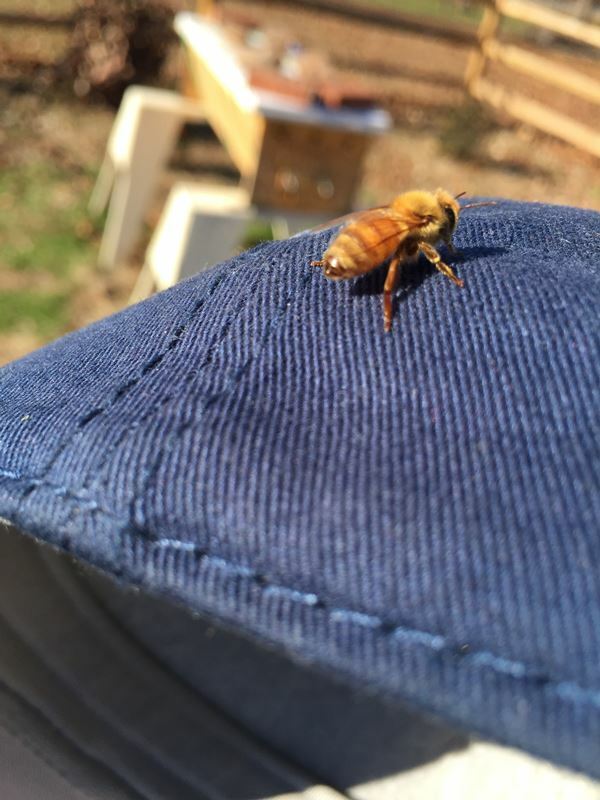 Yes, I enjoyed The Buzz About Bees – well worth it. There is a link to my post on it in the second paragraph :). Definitely pick it up yourself if Santa doesn’t bring it to you.